SACRAMENTO, CALIFORNIA (October 6, 2016) – Arguably one of the nation's top pavement Sprint Car rides will gain a new pilot, as Glenn Hutchison's #8 Orchex / All Valley Towing Rex Hutchison Beast prepares for this weekend's Royal Purple King of the Wing national races in California. Bartlett, Tennessee standout Kyle Edwards will take the controls for Saturday's race at Stockton 99 Speedway and Sunday's King of the Wing national finale at Kern County Raceway Park in Bakersfield, CA. 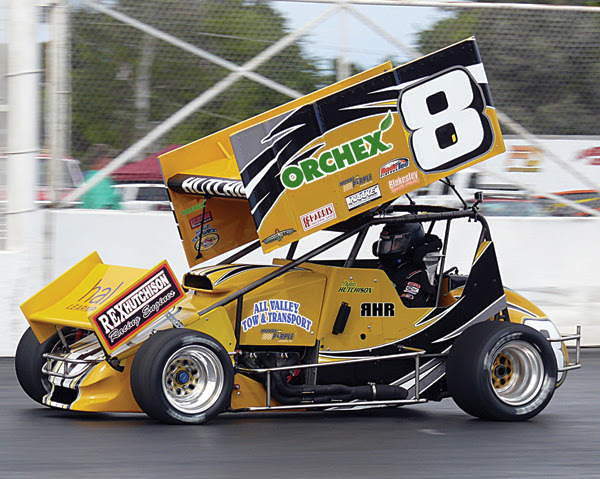 The yellow #8 ride has carried support from Royal Purple all season long, first driven by Hutchison's son Dylan before an injury sidelined his season. Idaho's Bryan Warf took over and stormed to Western Series wins at Rocky Mountain Raceway in Utah, Madera Speedway, and Stockton 99 Speedway. All told in five starts the car has finished no worse than third. Edwards has been competing on a part-time basis in both the ISMA Super Modifieds and King of the Wing for several seasons. He opened the year with eighth and fourth place finishes in the King of the Wing Southeast swing in April along with a heat race win. His career-best King of the Wing effort came in Florida last year where finished second at Five Flags Speedway. He has nearly 30 career Super Modified top-tens, finishing second in the 2014 MSA points and a 2016 best-run with IMSA of a sixth place effort at Delaware Speedway in Canada. He finished fifth in the 2014 inaugural King of the Wing national points as well. His best possibility for his first King of the Wing win may come Saturday at Stockton, where the #8 team has been very strong on the 68 year-old quarter-mile. 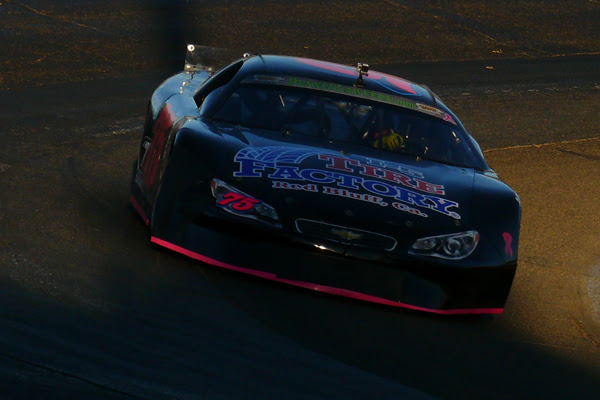 In addition to Warf's win this year in August, Dylan Hutchison drove to fourth last November as well. Kern County Raceway Park is the biggest track in the national pavement sprint car scene and will pose a nice test for both Edwards and the Hutchison team. This year's Western Swing is only two races which gives teams much better odds for their cars holding up on the big KCRP speedway. Bakersfield, CA – For 2016, the SPEARS Southwest Tour Series increased its minimum Winner’s Purse to $5,000 (up from $3,000). However, for the upcoming “BULWARK FR 150 presented by 51 FIFTY Energy Drink” at Kern County Raceway on October 29th, the pot just got a little sweeter. Thanks to new series sponsor, ‘His Works Gift Basket Co.’, the driver leading at the halfway break, will receive a $1,000 bonus. If that driver is fortunate to go on and win the race, they’ll haul in a $6,000 payday. “We’re always grateful for new sponsors coming into our series and we couldn’t be more proud for ‘His Works Gift Basket Co.’ utilizing the SPEARS Southwest Tour Series to help launch their company.” stated the SRL’s Brian Olsen. “Laticia and Kevin (Peters) have been longtime supporters of ours and we’re thankful that they’re sponsoring the halfway bonus and giving back to our teams”. “As a new company, we’re excited to be involved with the SPEARS (SRL) Southwest Tour Series in the sponsorship of such an exciting event at Kern County Raceway. The SRL has established itself as the premiere Super Late Model Touring Series in the West, and we are proud to have the opportunity to be associated them. In addition, Kern County Raceway is one of the finest short track facilities on the entire West Coast. With race fans being the most loyal fan base in sports, we feel this combination is perfect for a company that strives for quality.” commented ‘His Works Gift Basket Co.’s’ Laticia Peters. The “BULWARK FR 150 presented by 51 FIFTY Energy Drink” at Kern County Raceway is the penultimate race of the 2016 SPEARS Southwest Tour Series season. The October 29th event is the “3rd Annual Fall Classic at KCR and will feature the INEX Legends, Mini Stocks, Super Stocks, RCF SPEC Late Models and the 150 lap SPEARS Southwest Tour Series feature. Spectator gates open at 4pm with $15 General Admission tickets and $20 Reserved tickets. Family Four Packs (2 Adults, 2 Kids 6-15 years old) available for only $35. 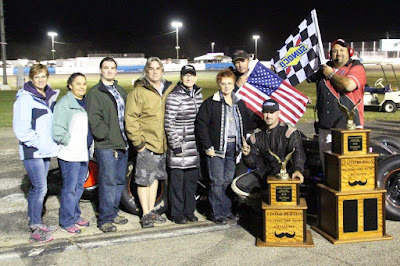 About the SPEARS Southwest Tour Series: Celebrating its sixteenth season in 2016, the SPEARS Southwest Tour Series is a regional stock car series competing on paved ovals in the southwestern portion of the U.S. http://www.srlsouthwesttour.com. “The SPEARS Southwest Tour Series…Where the Champions Race”. We begin our listings this week with special events in the California cities of Stockton, Bakersfield and Madera because their tickets are so hot you may need protective gloves to hold them. STOCKTON 99 SPEEDWAY. 1/4 MILE. STOCKTON, CA. www.stocktonspeedway.com FRIDAY & SATURDAY, OCTOBER 7TH & 8TH. KERN COUNTY RACEWAY PARK. 1/2, 1/4 & 1/8 MILE. BAKERSFIELD, CA. www.kernraceway.com SUNDAY, OCTOBER 9TH. These two tracks are linked together this weekend because they're both presenting the California based season finale, and championship weekend, for the Royal Purple King of the Wing National Sprint Car Series. This special evening at the Stockton 99 is being presented by Orchex with additional co-sponsorship Xyience Energy Drink. Also on the Stockton race agenda will be the BCRA Midgets, the NCMA Modifieds and the San Jose Modifieds. The front gates will open at 5pm with the green flag falling over the racing at 6pm. Adult tickets, age 16 to 59, are $20. Tickets for juniors, age 11 to 15, and seniors, age 60 plus, are $15. Kids age ten and under will be admitted free. Once the checkers fall at Stockton, it will be time for the teams from the King of the Ring Series to load up their cars and equipment to make the trip to Bakersfield - the home of the Kern County Raceway Park for Sunday's George Snider Classic. For the third consecutive year this national sprint car series will be finishing their racing season, and crowning a champion, at Kern Raceway. This series has, without doubt, the fastest cars to ever compete on the Kern Raceway's 1/2 mile, high banked oval. The all time track record, 14.29 seconds, was set by driver Jo Jo Helberg. On Sunday night the Sprints will be running a series of heat races and then conclude their 2016 season with a 40 lap main event. The George Snider Classic was named in honor of Indianapolis 500 legend George "Ziggy" Snider of Bakersfield who made 22 starts in the "Indy 500" driving for legendary car owner, and longtime friend, A J Foyt. Also participating in Sunday's on track action will be the NASCAR Super Stocks, the INEX Legends and the 911 Racing Series. The spectator gates will open at 2pm followed by a King of the Wing practice session at 215pm. Fans will be invited to visit trackside for a driver autograph session at 330pm. King of the Wing single car qualifying will commence at 410pm following by racing at 5pm. Adult tickets, age 16 plus, are $15. Tickets for seniors, age 65 plus, active military with valid ID and kids, age six to 15 are $10. Kids age five and under will be admitted free. The raceway will also be offering a family pass, priced at $35.which admits two adults and either two seniors or two kids. Reserved stadium seats, at $20, are currently available. LOAN MART MADERA SPEEDWAY. 1/3 MILE. MADERA, CA. www.racemadera.com FRIDAY & SATURDAY, OCTOBER 7TH & 8TH. Here's the other red hot ticket of the weekend. The fastest one-third mile in the west is going to be handing out a lot of money to race drivers this Saturday night. The evening will be highlighted by the 125 lap, $10,000 to win, short track shootout for the MAV TV Televised Loan Mart Open Late Model Series. Also on this hot ticket will be the Lucas Oil Modified Racing Series, presented by Loan Mart, who will run a 75 lap main event that pays the winner $5,000. 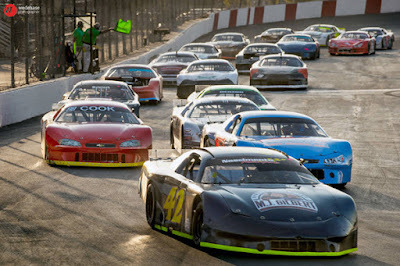 Also on the Madera race agenda will be the Super Hobby Stock Series, Race #8 of the 51 FIFTY Junior Late Model Series and the Mini Cup Nationals. The Loan Mart Madera weekend starts on Friday Night with an open practice session for all divisions from 3 to 9pm. The grandstands will be open free of charge for the fans. Saturday race day begins with practice at 1030am, qualifying at 1245pm. heat races and B mains at 3pm with opening ceremonies and main events beginning 530pm. General admission tickets, age 13 and up, are $15. Tickets for Seniors and military personnel are $13. Youth tickets, are six to 12, are $7 with kids age five and under admitted free. If you're thinking those are low prices for a special event featuring that many racing divisions and laps you're right. Those ticket prices were made possible thanks to track sponsors Loan Mart, 51 FIFTY Energy Drink and Twisted Tea. IRWINDALE EVENT CENTER. 1/2 & 1/3 MILE OVALS 1/8 MILE DRAGSTRIP. IRWINDALE, CA. www.irwindalespeedway.com THURSDAY, OCTOBER 6TH & FRIDAY AND SATURDAY OCTOBER 7TH & 8TH. Once the Irwindale Event Center will divide it's oval tracks into sections to present two totally diverse forms of racing. It all begins with their NHRA Thursday Night Drag Racing program. It's street legal racing sending the all important message race the strip and not the streets. The spectator gates will open at 4pm with the drag racing running from 5 to 10pm. This program is very budget friendly; you can race all night for a $20 entry fee. Spectator tickets are priced at $10. Then on Friday and Saturday the IEC will present two nights of slideways, rubber burning, Formula Drift. presented by BlackVue. It's the final night of the season and the O'Reilly Auto Parts Title Fight, presented by Gum Out, will decide which driver was the best of the year. On Friday the gates will open at 2pm followed immediately by a practice session for all divisions. Qualifying rounds will be held at 415pm followed by an on track autograph session for the fans at 645pm. Saturday's gates will also open at 2pm and will be followed by a practice session. At 340pm the Pro Main Competition, Round of 32, will begin. Following an intermission at 530pm, there will be a VIP Experience track walk at 6pm. Then, following opening ceremonies at 7pm, the track gets hot with the main competition: the round of 16. There is a variety of ticket options for the fans featuring both single day and two day pricing. The information and tickets can be obtained from the speedway's official website. LAKEPORT SPEEDWAY. 1/4 MILE. LAKEPORT, CA.www.lakeportspeedway.com SATURDAY, OCTOBER 8TH. Furia Motorsports will be presenting a lot of action and destruction at lakeport this Saturday night by featuring jalopy racing, boat racing and those behemoth monster trucks. The spectator gates will open at 330pm with the showtime set for 6pm. General admission tickets, age 12 plus, are $15. Tickets for kids, age five to 11, are $12. MAGIC VALLEY SPEEDWAY. 1/3 MILE. TWIN FALLS, ID. www.magicspeedway.com SATURDAY, OCTOBER 8TH. It's championship night at Magic Valley. That usually means the racing intensity is usually amped up a notch with drivers prepared to do what is necessary to improve their final points standings and collect those bonus checks at banquet time. Providing the on track action Saturday night will be the Royal Purple Mods, the National Guard Super Stocks, Project Filters Street Stocks, Quale's Electronic Junior Stiners and the evening will conclude with the Quale's Electronics Trailer Race of Destruction. The spectator gates will open at 5pm followed by McDonald's time trials at 630pm and racing at 7pm. Adult tickets, age 13 plus, are $15 with tickets for seniors, age 62 plus, priced at $10. Kid's tickets, are six to 12, are $3. Military personnel with ID are always admitted free at this speedway. ROCKY MOUNTAIN RACEWAY. 1/4 MILE. WEST VALLEY, UT. www.rmrracing.com. SATURDAY, OCTOBER 8TH. It's championship night #2 at Rocky Mountain this Saturday. Racing divisions, with drivers going after those last chance bonus points, will include the Shoq Late Models, University Federal Credit Union Sprint Cars, Midgets, the Sommers Auto Wrecking Hornets, and Tucker Towing Deckers. The front gates will open at 4pm followed by qualifying at 5pm, heat races at 6pm and main events at 7pm. General admission tickets, age 13 and up, are $15. Youth tickets, age five to 12, are $5 with kids age four and under admitted free. 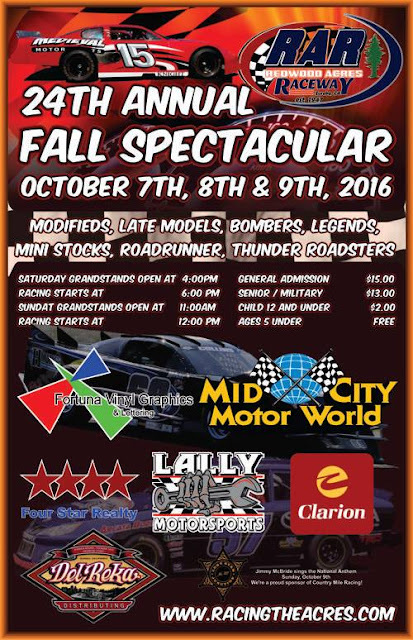 MADERA, CALIFORNIA (October 5, 2016) – A pre-entry list approaching 60 cars is set to battle on Saturday night, with the fourth annual Short Track Shootout Saturday at LoanMart Madera Speedway. The top drivers in the west will battle for 125 laps for $10,000 to win in the prestigious MAVTV-televised event. The Short Track Shootout has grown incrementally each year to become one of the top Late Model events in the nation and serves as the eighth and final 2016 points race for the LoanMart Late Models as well. 51FIFTY Jr. Late Models and Super Hobby Stocks have their season finales along with Lucas Oil Modifieds and Mini Cups in action. Erickson and Philpott will take on challengers from all over the Western United States, including NASCAR K&N Pro Series, West champions and Short Track Shootout winners Mike David of Modesto and Eric Holmes of Escalon. For Holmes, his resume in the Short Track Shootout is 2-for-2 with the 2014 and 2015 editions, while David won it in 2013. "It's going to be tough. I think we'll have a really good car this year. We gotta drive a smart race this year," Holmes said. "I feel like this will be the most interesting race ever. The track is in good shape and will make good racing. We've got a lot of talented drivers that have won races all over the country. There's a wide range of drivers and teams and its going to be an exciting race." The driver that has come the closest to victory might be 2016 NASCAR State and Irwindale Speedway champion Trevor Huddleston. Huddleston will return again for another shot at the five figure first place prize. The top drivers from the Stockton area, who share a race shop, of Larry Tankersley and Dennis Byers are both expected to travel south to Madera. 2015 LoanMart Late Model champion Buddy Shepherd, who is a perfect 10-for-10 at Kern County Raceway Park in 2016, returns to Madera and Kern County third in points Racin Vernon has entered too. A jam-packed program will see the top-ten qualifiers make the show and then redraw for their starting positions. Positions 11-20 will be filled by the top-two finishers from each of the five heat races. iPull-U-Pull presents the $1000 to win B Main to fill out the rest of the 26 car starting lineup with a possible C Main pending car count. Saturday's B Main will be a split format similar to the Lucas Oil Modifieds, with transferred cars being moved out of the race and the remaining drivers will battle for the first place prize money. The entire program is a one-day show with Friday's activities only including an optional practice. Former Altamont regular Doyal Moen, now residing in Jerome, ID, won the random draw of pre-entries to have his entry paid in full. Yakima, WA (October 4, 2016)–When fans arrived Sunday for the 29th Annual Fall Classic at Yakima Speedway they knew the race would be exciting based on past history. Jason Jefferson provided a thrilling performance to give the fans plenty to talk about with the off-season approaching. The veteran driver from Naches, WA came from the back of the pack with less than 40 laps remaining, having to pit for a flat tire while leading, to win. Jefferson was able to hold off his friend and mentor, Garrett Evans, during a rash of late race cautions. Zack Beaman who battled back from two flat tires, finished second with Andy Sole and Braeden Havens rounding out the top-5 finishers. The weekend started out with 32 drivers making the trip to the historic race. Only 30 would make it to qualifying after incidents in practice. The 2015 Fall Classic winner, Tayler Riddle, captured the fast time award with a blistering 18.514-sec. lap. Beaman qualified second to set the front row of Sunday’s 200-lap main event. The top-15 cars would be locked in on time with a 30-lap qualifying heat run to set positions 16th through 30th. Riddle and Beaman brought the 30-car field to the green flag with Riddle grabbing the lead off of turn 2. Several cautions through the race’s first 50 laps kept the field bunched together. Caution on lap 74 set-up a restart with Jefferson on the outside of Riddle. The defending race champion beat Jefferson into the corner for the lead. Jefferson caught Riddle on lap 78 to take the lead for the first time. Jefferson and Riddle who also happen to be neighbors in Naches, battled for the lead until the mid-way break came out at lap 93. The race resumed after all drivers were able to make adjustments, add fuel and change tires. Riddle’s lead didn’t last long as Jefferson powered back to take the lead away on Lap 109. Jefferson would lead the filed through two of the longest green flag runs of the day as the past Apple Cup winner showcased the strength of his Ford Fusion. It seemed that Jefferson was going to be the car to beat until Lap 160. While the field was under caution Jefferson brought his car to pit road to change a right front flat tire and fell back to the 15th position on the restart. This would move Garrett Evans to lead with 40 laps to go. Evans had a strong car while running up front but the show that everybody at the track was watching was Jefferson as he weaved his way through traffic to advance back towards the front of the field. By lap 165 Jefferson had cracked the Top-10 while he was making his “KRC Power Steering” Power Move of the Race to the front. Jefferson only needed eight more laps until he was sitting in second place and working to pass Evans for the lead. It took just four laps for Jefferson to overtake the NWSLMS points leader Evans and regain his lead of the race. With just 21 laps left in the race Jefferson continued to hold control of the event but three late cautions gave Evans a chance on restarts. Knowing each other’s restart tricks after many late race duels, Evans and Jefferson played cat and mouse with each other for the lead when the green flag was thrown. The late cautions wouldn’t faze Jefferson, as he cruised to his first career NWSLMS win and first career Fall Classic victory. Jefferson is also the first in his famous racing family to win a Yakima Speedway Fall Classic in its 29-year history. October 1, 2016.... Anderson, CA...... Shasta Speedway hosted the championship race for the North State Modified Series, presented by Protect the Harvest, Saturday night, and it was Jason Philpot of Sacramento that lead the 60 lap “Lloyd Burton Against the Wind Modified Challenge” wire to wire to post his fourth NSMS feature win in 2016, and collect the $1500 first-place prize. But is was Kelseyville's Darrin Knight who was crowned the North State Modified champion for the second consecutive season. Nineteen modifieds clocked in to participate in this $11,000 memorial event. The purse was doubled courtesy of Burton's brother-in-law, Mort Houston, NSMS, and other Burton family members and friends. Lloyd Burton was a native of Shasta county who was involved in racing, promoting, and officiating at several tracks in northern California. He was also the founder of the Northern California Auto Racing Alumni Association. Lakeport's Charlie Collins set a new modified track record of 15.922 seconds with Knight the only other car in the 15-second bracket at 15.975. Collins drew an eight for the invert placing local driver Cody Braund, driving the Bob Lehman #82, and Philpot in the front row. NSMS 2016 Rookie of the Year Darrin Sullivan and Richie Potts shared row two, with Roseburg's Tom Ford and Eric Johnson in the third row. Knight and Collins were next in line. Philpot forged ahead at the start with Braund and Sullivan next in line. Before even one lap was complete a 6-car pile-up in turn four resulted in four cars towed to the pits including Potts, Johnson, Guy Young and Herman Pulyer. Terry Deal and Michael Morrison also pitted but returned to the track at the back of the field. When racing finally got under way Philpot powered ahead again followed by Braund, Sullivan, Knight, Collins and Rich Cobb. Collins swapped places with Knight on lap four as Philpot was driving away. Collins drove by Sullivan for third on lap 13 with Knight passing Sullivan the following round. Both Collins and Knight were on a mission, and when the lapping process began, Collins swapped places with Braund and set his sights on the leader. Knight moved into third, dropping Braund to fourth on the 20th circuit, as Philpot was enjoying a 5-car length advantage on his competitors. Collins and Knight gained ground on Philpot at mid-race, and at the Swartz Diesel half-way marker the running order was Philpot, Charlie Collins, Knight, Braund, Sullivan, Morrison, Cobb, Mike Collins, Codi Barba, Terry Deal, Tom Ford, Josh Stewart, Adrianna Strugnell and John Baker. Baker spun on the back-stretch on lap 37 to bring out the second yellow flag, and at that point Terry Deal was given the lucky dog placing him back on the leader's lap. The next five laps saw Collins attempt to move under Philpot, but each attempt failed. At the same time Collin's car showed signs of something rubbing on his tire, causing it to smoke. Track officials stopped the race to check the tire and both the officials and the driver determined that Collins could continue. However, the cards were not in Collins' favor and the tire blew the following round ending his bid for the win. The final laps saw Philpot and Knight nose-to-tail, and at the checkered flag it was Philpot, Knight, Braund, Sullivan, Morrison, Mike Collins, Cobb, Barba, Deal, Ford, Stewart and Strugnell. Randy Houston, Lloyd Burton's nephew, developed motor problems in hot laps and was unable to start. Burton's wife Mary Burton, son Danny Burton, daughter Christine Burton and their families presented the hand-carved eagle trophy to Philpot. Philpot's name will also be engraved on the 4-foot tall perpetual trophy donated by Mort Houston. In the Lucas Oil Dash for Cash Terry Deal collected $100 for the win, with Mike Collins getting $50 for second. Barba won the Wenteq Hard Charger Award. 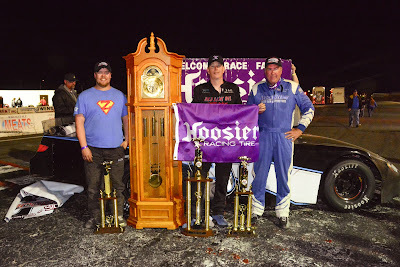 Charlie Collins earned the Penney Racing Supply/Sunoco Fast Time Award. Naake Suspention prizes went to Morrison and Deal. Adrianna Strugnell won the D.J. Safety certificate. SINISTER DIESEL FALL CLASSIC : Jason Philpot, Darrin Knight, Cody Braund, Darrin Sullivan, Michael Morrison, Mike Collins, Rich Cobb, Codi Barba, Terry Deal, Tom Ford, Josh Stewart, Adrianna Strugnell, Charlie Collins, John Baker, Richie Potts, Eric Johnson, Guy Young, Herman Pulyer, Randy Houston DNS. After a two year hiatus, the Fall Spectacular is set to return this weekend October 7th, 8th, and 9th at Redwood Acres Raceway. It is sure to be a fun-filled weekend as seven divisions will partake in the racing action on the 3/8-mile paved oval. It will be the 24th running of the event which originated in 1990. Two of the divisions will be racing full programs on both nights, the California State and Federal Employees Credit Union roadrunners and the Thunder Roadsters. Of the 11 roadrunner point races in 2016, there were nine different winners. The feature events for both Saturday and Sunday should be wide-open. The Thunder Roadster division featured some of the tightest racing at the Acres in 2016 and it should be no different as 2016 track champion, Tommy Payne will be among the favorites to win on both nights. The Legends cars will also be in action after what’s been a successful first season of action for the division at RAR. The winner’s share for the Sunday race is $500 with a minimum of $100 just to start the feature. 2016 champ, Robert Miller and championship runner-up, Brad Curtice will be the local favorites for the event. The Humboldt Hydroponics mini stocks will have a 40-lap feature on Sunday. $500 dollars is on the line for the race winner and it is anyone guess as to who will be the winner when the checkered flag falls. With 2016 mini stock champ, Gary Klinetobe announcing his retirement at the end of the final point race on September 24th, the door opens for his closest challengers in Eugene Palmer and Jarrett Mayo being the favorites for Sunday. Another driver who will be a contender is Rick Estes who won four main events during the season. The Fortuna Wheel and Brake bombers will have two main 50-lap events on Sunday. $1,000 will be awarded to the winner of each race. In addition, another $1,000 will be awarded to the driver who has the best average finish between the two races and an additional $1,000 will be awarded if a driver sweeps both feature events. The top bomber drivers in the region are expected to show for the event while local drivers like Ryan Walters and John Lally among the locals hoping to defend their home turf. Modifieds will take to the Acres for the third time in 2016. The prior two races were North State Challenge Series events which were swept by Darrin Knight. The 60-lap feature pays $1,500 to win with a minimum of $200 being paid for starting the feature. Fast time for the division will earn a driver $100 while winning in one of the qualifying heats will fetch a driver $75. Over 20 drivers have pre-entered for the 100-lap feature event for the late model cars. Several past winners of the race are expected to show including four-time winner, Mike Sackett, 2-time winner, David Miller and 2012 champion, Jeremy Doss. Others who have entered include Randy Houston, Eric Gannon, Allen Cress and racing legend, Jim Walker. One driver who will not be racing is 2016 Mid City Motor World late model champ, Mic Moulton who is still recovering from injuries. Driving his car will be Acres veteran, David Henderson. The feature pays $2,000 to win with a $500 minimum payout for starting. Like the modifieds, fast time will be awarded $100 while the qualifying heat winners will earn $100. Manteca's JR Courage finished second at Ukiah in July after leading the much of the first half of that race. He followed up on that performance by winning the American Racer Tire Dash on Saturday worth a set of tires and the pole for the feature. 2016 PCS Rookie of the Year Matthew Wendt took the lead on the initial start from the outside pole and brought Beeler with him on lap eight. Courage was forced up to the outside line by Beeler, and despite enjoying the outside line in the dash Courage fell back to fifth. Tracy's Jeff Bischofberger got around Doss for third on lap 25 when Doss swung wide coming out of turn four fighting a loose condition and no power steering. The lead pack of Wendt, Beeler, and Bischofberger staged a very intense battle that thrilled the fans on a cold night, with Wendt doing a great job fighting off the touring stock car veterans for many laps. The tight exciting action on the quarter-mile continued when Courage took fourth from Doss as well. Beeler tagged Wendt in turn one on lap 55 and in the process lost second to Bischofberger. Bischofberger turned up the heat on Wendt as well with it boiling over on lap 65. Wendt slid off the track on the backstretch and bounced over the off ramp sending him sliding through the infield. Wendt slid back onto turn three and was clipped by Bischofberger, ending both of their nights. Beeler assumed the top position with ten laps to go with Courage restarting on the outside and Doss inside the second row. Doss used the restart to dash up into second and a side-by-side battle ensued. Doss took the lead on lap 70 and Beeler gave his all in several attempts to take the lead back. With two to go, the pair banged doors down the front stretch before separating. Doss was able to survive an onslaught of late race challenges for a two car length victory over Beeler with Courage third, Danny Malfatti fourth as the final finisher. Loomis' Chris Scribner lost his engine in the dash to end his evening early. Danny Malfatti won the Penney Racing Supply Hard Charger award. The Pacific Challenge Series championship may be complete, but arguably the series biggest event is still on the calendar. The non-points "October Classic 100" will take place on October 15th at All American Speedway as part of the prestigious TOYOTA/NAPA Auto Parts 150 presented by Trico Welding weekend. The third annual event attracts the PCS' largest crowd annually.